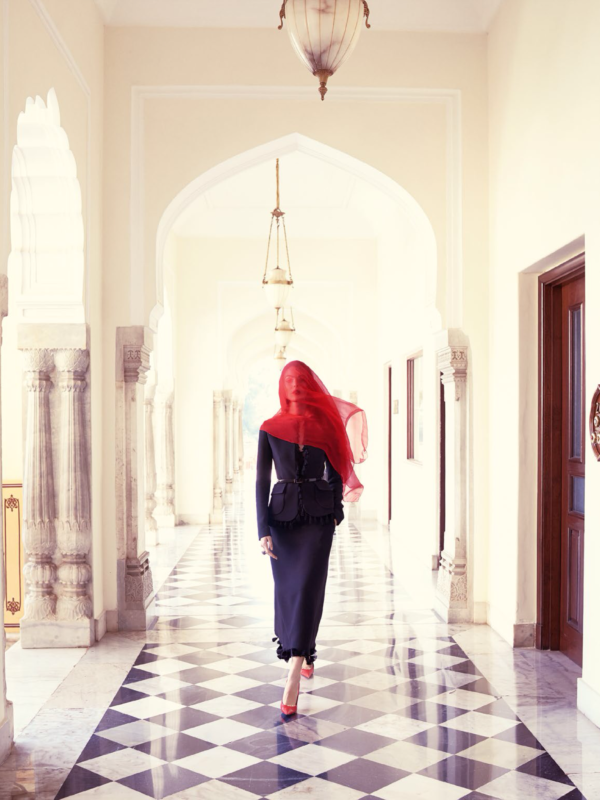 This beautiful story, shot in Jaipur by Mario Testino, is from the May issue of Vogue Paris. Anastasia Barbieri’s styling makes me yearn for a bit more glamour in my everyday life—it may be time to step up my run-around game. Wow Preston! Everything about this is…gorgeous. The surroundings, the clothes, the accessories, the hair, the make-up. Adding to all this glamour is her posture. Extraordinary elegance. Thank you for posting. “India Song” is also the name of a gorgeous Marguerite Duras film about French ennui in Indochina, and the eponymous title song from that film, sung by Jeanne Moreau, is one of my favourite songs ever. A nod, it seems, to Richard Avedon. Who was that model from his shoot in India in the early 60s? The model is Vittoria Ceretti. I don’t usually become obsessed with models, but I find Vittoria mesmerising in everything she appears in. A bit like Amber Valetta. There is just something timeless about her. These pictures are divine too. I love the fur coat (is it The Row?). Sadly, there’s no season to wear fur here in Australia! Beautiful images. If you have not visited India then put it on your to do list! There is winter in Melbourne, in the State of Victoria. In Australia. Strike that- I meant Norman Parkinson’s photo shoot with Anne Gunning. Or was it Barbara Mullen? This feature is everything I and my life are not…..and yet I find so compelling. The last shot deserves a long look. So evocative of Norman Parkinson’s photos taken in Rajasthan. Kind of heartening to see that not much has changed. This is lovely – and yes, very Norman Parkinson.